While campaigning for Hillary Clinton in Ohio on Sept. 1, Vice President Joe Biden brought up his son's death while being heckled by an audience member. "My American friends died!" the heckler yelled at Biden while criticizing America's anti-ISIS strategy in Syria. Biden addressed the question, but the audience member kept shouting, "My friend died!" as Biden attempted to speak. "So did my son," the vice president replied. The heckler promptly quieted down. Biden's son Beau served in Iraq and as Delaware's attorney general. He passed away from brain cancer in 2015. The audience member was challenging a directive the U.S. government had given to Kurdish allies fighting the Islamic State in Manbij, Syria. The U.S. had authorized the YPG, a primarily Kurdish army, to take control of Manbij from ISIS, but only under the condition that it would withdraw from the city afterward and make way for Turkish forces. The YPG succeeded in taking back Manbij, but then refused to leave the city, prompting Biden to say (during a recent trip to Turkey) that they'd lose U.S. support if they didn't withdraw from west of the Euphrates River and allow Turkish special forces to come in. The heckler apparently didn't agree with this decision, feeling that the YPG should have been allowed to stay in Manbij. "Why did you tell the YPG to go back across the Euphrates?" the man shouted. "The deal was to get them into Manbij," Biden replied, "[Then] they'd go back across the Euphrates so we could have special forces move in. That's why." The heckler repeated, "My friends died!" again after more back and forth. "Will you listen?" Biden asked. "So did my son, OK?" Beau's death was not the first personal tragedy Biden faced during his time as an elected official. One month after being elected to the Senate for the first time, his wife and infant daughter were killed in a car crash. Beau survived the accident, and Biden was sworn in at his bedside. 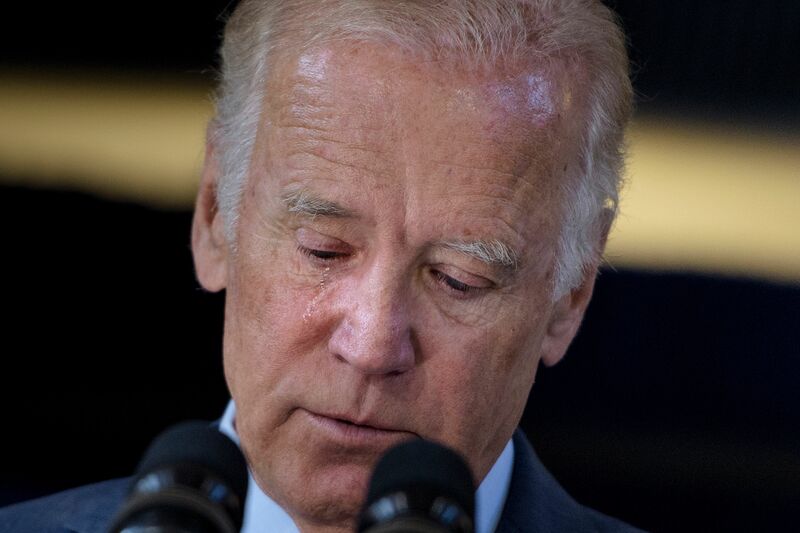 Thursday's incident was reminiscent of a moment during the 2008 vice presidential debate, when Biden choked up while referencing the deaths of his wife and child. As for the heckler, he abruptly became a lot more respectful as soon as Biden mentioned his son's death. Biden then invited the heckler to have a conversation with him backstage after the rally.